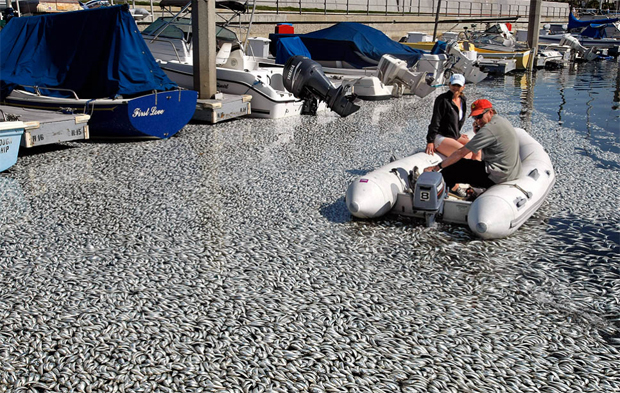 Authorities in Redondo Beach are investigating what killed millions of fish over the last day at King Harbor Marina. Fish, including anchovies, sardines and mackerel were floating lifeless in Basins 1 and 2 of the north side of King Harbor Marina. "There’s basically fish everywhere you go in the harbor," said the harbor's assistant manager, Jason McMullin, who added that there were reports that a red tide may have driven the fish into the harbor in massive numbers where they died because of limited oxygen. Suppose they revved up that outboard and let her rip. Eeeiiuuuwww! If the fish died from natural causes (hypoxia, eg) that would make excellent fertiliser. ETA: thanks for the IotD, coolcat. I'm amazed they're making such a hullabaloo of this. It happens all the time. Our harbor had it happening every other year until they fixed it. They installed large motors with propellers on them all over the harbor. When the fish show up they turn them all on. It thrashes the water into an aerated foam and simultaneously reduces the incentive for the fish to hang around in the maelstrom. While the fish show up regularly there's never been another big die off. BTW when those fish die? They rapidly decompose into an oily mess. The oils strip the very expensive paint off the bottoms of all the boats. This causes great hues and gnashing of teeth. News today says they've removed over 20 tons of the dead fish. Still working on that, but concerned also about the fish that are dead and NOT floating on the surface. Considering bringing in a "vaccuum" boat, possibly with a diver, to help remove the dead fish from the bottom of the marina. Yes, it's all going to be sold to a fertilizer company, to help defray the costs of the clean up. Sounds like the hull repainting business will be picking up! Off-topic, but is Charlie Sheen the biggest space cadet of the last decade, or what? I thought Lindsay Lohan might top the list, but she's suzy stable, compared to Charlie. They heard the tsunami was coming and decided to take themselves out early? Adak: Agreed there on Charlie. Well wouldn't you know it? Our harbor was the one that got creamed by the tsunami today. You know. The one on all the national news channels all day. I think we should break it down in smaller batches. All those fish will never cook at once. Woo-Hoo! .. The Road Kill Grill, will now be able to broaden the menu, to include seafood .. with fresh anchovies, sardines and mackerel listed as being immediately available! You know how they say animals can tell when an earthquake is coming? Maybe these guys suicided rather than face the tsunami.